The footprints of the classical Hamiltonian chaos in the quantum domain are well explored (after more than thirty years of research), and the genetic links between its tokens - such as KAM-tori and Arnold diffusion and their quantum manifestations - are explored in great detail. The question we want to address is: Could something similar be done for the dissipative chaos? 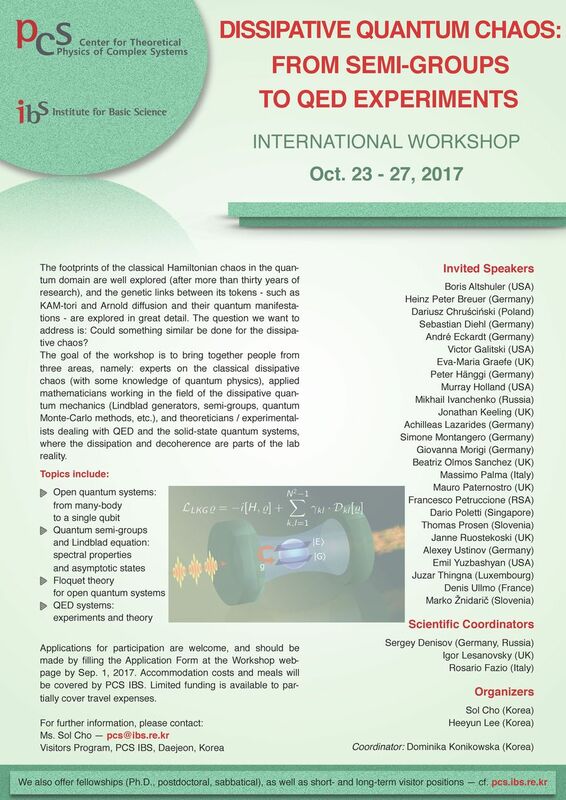 The goal of the workshop is to bring together people from three areas, namely: experts on the classical dissipative chaos (with some knowledge of quantum physics), applied mathematicians working in the field of the dissipative quantum mechanics (Lindblad generators, semi-groups, quantum Monte-Carlo methods, etc. ), and theoreticians / experimentalists dealing with QED and the solid-state quantum systems, where the dissipation and decoherence are parts of the lab reality.